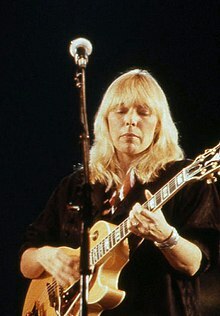 Amhránaí agus cumadóir ceoil Ceanadach is ea Roberta Joan "Joni" Mitchell (née Anderson) a rugadh ar 7 Samhain 1943 i Fort Macleod, Alberta. Chaith sí cuid mhaith dá hóige i Saskatoon, Saskatchewan. Thosaigh sí ag gabháil fhonn i gclubanna oíche beaga i Saskatchewan agus in Iarthar Cheanada. Chaith sí tamall ansin i dTorontó ag buscáil agus ag canadh i mbeáir, hallaí pobail agus a leithéid. Sa bhliain 1965, thug sí aghaidh ar na Stáit Aontaithe. Chas roinnt amhránaithe sna Stáit amhráin a chum sí (mar shampla, "Urge for Going", "Chelsea Morning", "Both Sides, Now", "The Circle Game"), rud a thug an deis di conradh a shíniú le Reprise Records agus a céad halbam a thaifeadadh sa bhliain 1968. ↑ "A Case of Joni: Mitchell Curates New Love-Themed, Career-Spanning Box Set". The Second Disc. Tugadh an leathanach seo cothrom le dáta an 31 Lúnasa 2017 ag 13:54.